Having previously reported on the taco trucks outside the "R" Ranch market I decided to head back to check out the taco wagon that parks on the Northeast side of W Adams and Redondo Ave. 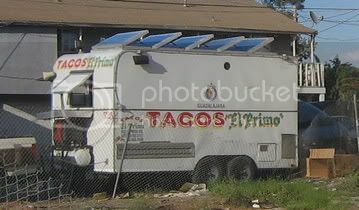 While the other two trucks in this area operate during the day and night, Tacos El Primo rolls into a dirt alley behind the vacant lot on the Northeast side of the street everynight at around 5pm. 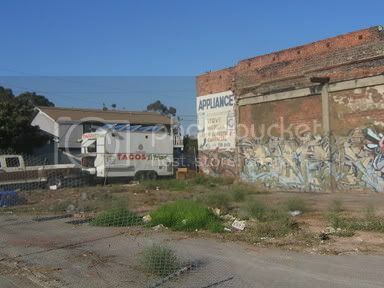 Other than the street art which adds some character this vacant lot is a disaster. Broken down fences, abandoned shopping carts and trash liter the area. One has to wonder why City Hall is so worried about clamping down on the taco truck culture when there are so many other important issues to deal with. 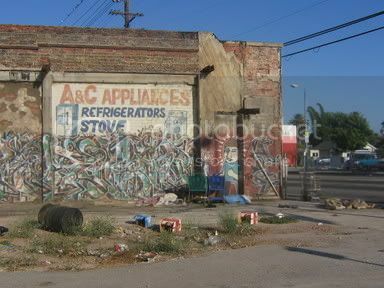 I’ve been all over the city on this taco journey and sadly there are many run down areas of the city that are being neglected. The fellas at Tacos El Primo are on their game though with a rotating al pastor spit for the pork and a cylinder grill for braising asada and other cuts of beef. The smell of grilled onions and chiles filled the air as I looked over the choice of meats - asada, al pastor, cabeza, lengua, buche. I ordered asada, cabeza, al pastor and watched as the cook cut slices of pork from the spit next to a small pile of grilled onions mixing the pork and onions together and then scooping them up into the tortillas. 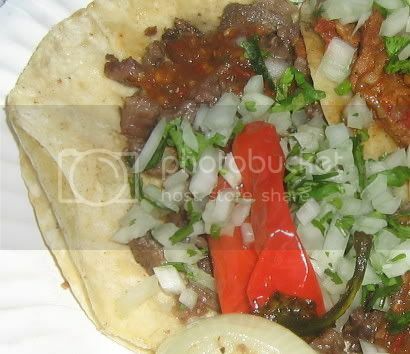 My tacos came with a grilled onion and a red jalapeno, a nice touch. I didn’t eat the onion but I just like having a big grilled onion on my plate for some reason. There was also a help yourself salsa bar attached to the wagon with a tasty salsa roja de chile arbol and tomatillo salsa verde as well as onions, cilantro and radishes. The cabeza was somewhat fatty but didn’t have the gamey flavor I’ve had with some cabeza. 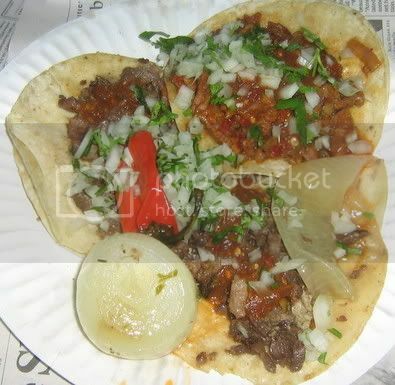 It wasnt as good as the cabeza from Chatos Tacos but it had some good qualities. The carne asada was very soft, the excess grease from the beef soaked into the tortillas with the salsa adding the proper balance. The al pastor was the best out of the three. The carmelized onions and slices of soft pork were excellent. The spicy chile arbol neautralized the sweetness of the pork and the toasted corn tortillas were sturdy enough to hold it all together. 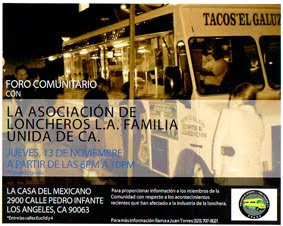 The corner of Redondo ave and W Adams is somewhat of a taco colony. I’d probably rate Tacos El Primo’s al pastor slightly better than Leo’s across the street but I may need to try them both again on the same day for a definitive answer on that. After eating my tacos at El Primo I walked across the street to Don Jose and ordered a carnitas taco. I was previously disapointed with Don Jose and the carnitas didn’t change that opinion. It was literally a gob of warm pork fat. If you want to check out all three trucks wait until after 5pm but if it’s mid-day and you’re jonesing for a taco Leo’s and Don Jose will be there as early as 11am.